1. There are certain milestones you look forward to your children reaching–first smile, first tooth, first time they reach for you to pick them up, first shaky steps across the floor…however, the one milestone I'm less than thrilled about Elizabeth reaching this week is how to pull herself up on to the sofa. Where she finds it quite comical to stand up holding on to the back, then let go and allow herself to do a free fall plop down on to her rumpus, and/or back, depending upon how she sticks the landing. And of course a baby masters how to climb up on the sofa without a firm set of safety precautions established in her repertoire, or a means for getting down from said sofa that doesn't require tears and bruised cheeks, or help from her mother. I've been spending a lot of time on my sofa the past few days. 2. You will always be able to find someone else in a situation that is worse or harder than what you are going through. But that doesn't diminish or negate what you are experiencing or feeling. When a person needs a shoulder to cry on, an ear to complain in, be that shoulder or that ear. And in that moment, don't remind them that other people have it worse or harder. It's like the person who has one child and is experiencing a struggle can't complain to the person who has three or four children because how could her simple life, with only one child ever be as complicated as the person with three? That's just not fair. And life can't be broken down so simply. You have a right to feel what you are feeling, to struggle where you are struggling. And you have the right to be comforted and to give comfort. 3. You all do number two perfectly. I'm not sure I can say that I've ever read my blog comments through teary eyes, but this weekend and this morning, I did. I just needed that little bit of 'chin up' understanding and encouragement that came through in your words. When I talk to people who don't know blogging, the first thing I remark on is the community. But not the kind of community where the neighbors growl and groan behind closed doors about this person's noisy kids or that person's weedy front garden. But the kind of community where people wander from front porches, and linger together on the sidewalk. And share a cup of coffee, or pass along an extra quart of strawberries, or pick up their neighbor's tipped over garbage cans that have blown into the street. It's a community where people go out of their way to be nice, to encourage, to support, to help. Thank you. Over and over. 4. 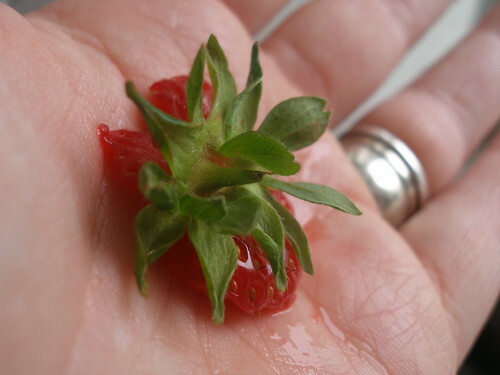 Is there much in this world that tastes better than strawberries that are still warm from being plucked from the vine? I don't think so. Look at that baby Elizabeth! I can almost smell her sweet softness, so beautifully cared for. My daughter, now 29, had hands like that ’till she was six. Her friend, at the time, Catlin, exclaimed one day, Melissa! You have biscuit hands. She was referring to the sweet knuckle dimples of a well loved and well fed little girl. Biscuit hands are just the best! Good post Molly! People have to remember everyone has a story. Every one you see has something going on in there lives that does not show on the outside. It is a big deal to be away from your husband so much. Hey where are you going to get adult conversation? I hate it when PS travels! I am always sad. keep smilin! Oh and I think you are a really good Mom. You amaze me how you can homeschool and get everything done that you do. How do you do it? See you tomorrow at lessons! I totally understand but in a different way. I am buying the house. As a divorced mom, I long to be able to turn to someone else and say *you just tell me when to pack*. LOL..I guess you could say that I am missing the husband that I have not found yet. I am glad that we can all hold one another up. That just amazes me about the blogging community. 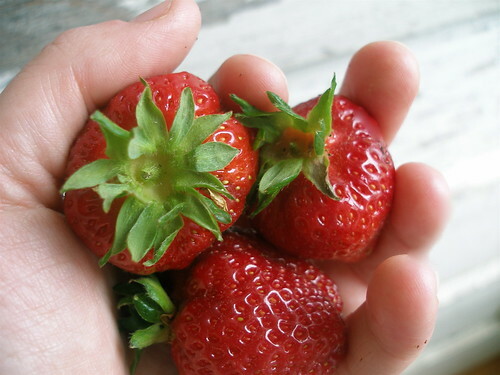 strawberries off the vine – divine! glad to know things are looking up! i remember those days sitting on the couch…she’ll figure out getting down before you know it. Know you are loved with an everlasting love. Oh, sweet, wise words. Enjoy those warm strawberries. Oh, sweet, wise words. Enjoy your warm, sweet strawberries. I’m so with you on number two. It’s too bad Emma doesn’t want to be Elizabeth’s elevator all day. Soon my friend you will at least be getting her down off your own sofa. Oh you are so right! I have wished twohundredbillion times that I could live in a commune with all the people on my blogroll. It’s just such a positive bunch, full of love and affirmation and “It’s OK, I’ve been there too” all over the place. Why must we all live in different states and sometimes continents? Glad you’re chin is up a bit more. You earned it girl! I loved the comment above that everyone has a story– and when we intersect with each other’s stories, we just don’t know the whole deal. Careful tongues and hands, and a pause to season with the grace we ourselves like to receive. . .
And Elizabeth is learning that snow melts! 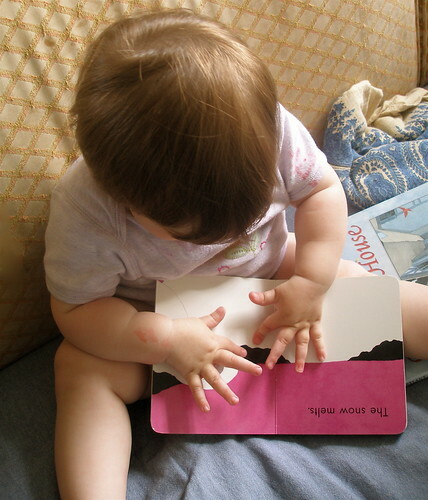 Is there anything more endearing than baby fingers pointing at and touching books?! I just took a photo of Eleanor’s hands doing the same the other night. Aww, sniff. If all your kind responders could live in one neighborhood (with front porches) together, that’d be a very sweet place to be. Oh Yes, no. 3 really spoke to my heart, because it finally made me realize why I value the few close friends I have in cyberspace. Before your post this morning, I always felt a little geeky, creepy, or weird conversing with people Ive never or barely laid eyes on. Who are these people I speak to across the miles and timezones? What have they to do with my life? You gave me my answer today. You guys provide for me what I long for from my childhood. Neighbors that do those things you mentionedvisit for a cookout, a cup of coffee, wave at you when they see you in the yard, bring in your mail when you are gone I have neighbors, neighbors who barely see us, rarely speak to us and are suspicious of this crazy SAHM with four kids who, omg, homeschools that litter of children. My parents and my husbands parents had this when I was a kid. Its what is missing from this generations lives now. Perhaps we CAN get a bit of that here and there on the net. Its the new visiting over the fence. Thanks for reminding me. Your blog is one of the very few I read daily and of the very, very few I ever post on. I guess that makes you my neighbor! Thanks for lifting my spirits this morning. 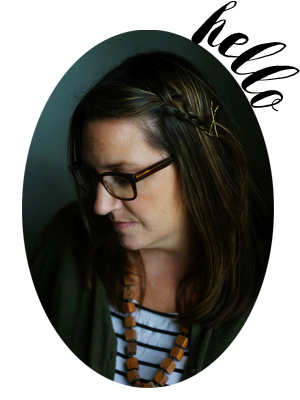 oh molly… this was much needed!beautiful words with beautiful pictures! have a blessed day! Oh, you are so right. There is so much need just to be heard, just to be understood, just to be validated or befriended without judgment. Thank you for an important reminder. My youngest just conquered the couch as well, and she’s already landed on her head. Amazing the way God daily protects my little ones from more serious damage. I learned a lesson from your last post in the power of words, both for good and bad. Thanks for being real. Lovely blog too! can’t stop reading! !